Most tarot decks are made up of 78 cards, divided into the Minor Arcana and the Major Arcana. The Minor Arcana is much like today’s standard playing deck – it has four suits to it. Although they go by different names in different decks, these suits are most commonly known as Wands, Swords, Cups, and Pentacles. Over the years, they changed into today’s modern suits of Clubs (wands), Spades (swords), Hearts (cups) and Diamonds (pentacles). These four suits represent the four directions of East, South, West, and North…and the four elements of Air, Fire, Water, and Earth. Each suit also has four face cards – the standard King and Queen, and then the Knight and the Page. In today’s playing deck, these last two have been merged together to create the Jack. Thus in a tarot deck each suit will have 14 cards rather than 13, and the entire Minor Arcana consists of 56 cards. The Major Arcana is made up of 22 cards, numbered from 1 – 21, and then the 22nd card is the card of The Fool, who is said to have no number…he is everywhere and nowhere, wandering amongst the other cards. Indeed, the Major Arcana is sometimes known as “The Journey of the Fool” and tells the story of the Fool’s travels through the cards, what each card has to teach him, and the lessons he learns at each step along the path. Each Major Arcana card shows a picture that represents that card and its meaning. Some of the cards will show a person (the High Priestess); some of the cards will show an object (the Wheel of Fortune). Often they will show both – a person holding a specific object, such as the Magician holding a wand, or the Hermit holding a lamp. The images on the cards are often symbolic, and have specific meanings that are important to understanding and interpreting that card. 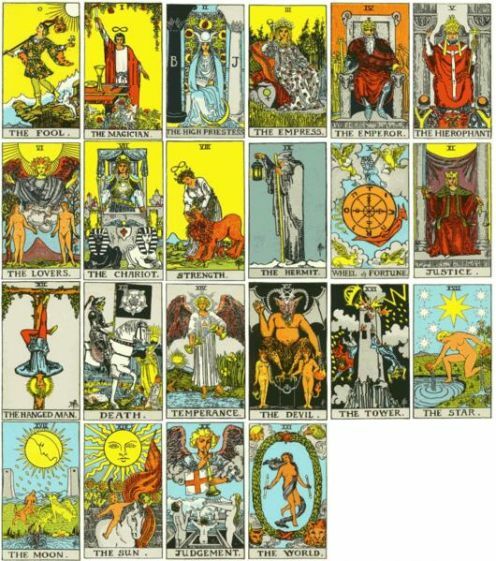 It is the Major Arcana cards that are used for determining your own Year Card. So how do you find your year card? By using your date of birth – the month that you were born, and the day that you were born. You will add the month and day to the year that you are wanting to study. 4 + 23 + 2012 = 2039. Now take the 2039 and reduce it down by adding up each of the digits… 2 + 0 + 3 + 9 = 14. Your Year Card for 2012 would be the 14th card of the Major Arcana, which is the card of Temperance. Thus you would want to study the Temperance card to discover what lessons it might have to teach you for the year. Now, if you are wanting to discover your card for THIS year, you would use the number 2011, since this is year 2011. To this you would add your month and day of birth. Let’s take my Spirit Sister, Crystal Dolphin. She was born on September 27th. So to find her Year Card for this year, I would add up all the digits… 9 + 27 + 2011 = 2047…2 + 0 + 4 + 7 = 13. Thus her card is the 13th card of the Major Arcana, which is the Death card. I would like to take a moment here to clarify that the Death card – contrary to what Hollywood might have you believe – does NOT represent actual death. Crystal does not need to worry that she’s going to die this year. Rather, it refers to change and transformation; the idea that something old must die in order for something new to take its place. It is actually a good card to receive, as it represents new beginnings and positive changes. This could end up being a very good year for Crystal. But Ocean…I don’t really know much about the tarot. How do I find out what my Year Card actually is, and what it means? Yes… this can be a challenge if you’re not familiar with the tarot. So I have posted the traditional listing of the Major Arcana; and without going too deeply into individual meanings and symbolisms, the basic meaning and interpretation of each card – the “theme” of that card that sets the foundation for your own theme of the year. You will find links to these meanings at the end of this post…because of the length, I have separated them into two – one for Year Cards 1 through 11, and another for Year Cards 12 through 22. So go ahead, readers…do the numerology part here and now. Add up your month, date, and year and find your number for 2011 (or any other year, for that matter). Then go to one of these posts to find out what your specific card is, and what it means. Perhaps in doing so you will gain some insight that will help you with the year! So what is YOUR Year Card for 2011? How do you interpret it? What lessons do you feel it has to teach you for this year? Feel free to share in the comments below! Special thanks to Mary K. Greer, tarot writer/teacher extraordinaire, for introducing me to the concept of Tarot Year Cards. I encourage my readers to check out her blog, and buy her books – this lady knows her stuff.